For reasons that they could not make clear, even to themselves, the men controlling the Third Reich determined that it would be a fine thing to exterminate 9 million European Jews. This is a difficult question for all righteous people, not only Jews. The Nazi genocide of Europe�s Jews was a unique historical event because the entire economic, scientific and military machinery of a modern industrial state was used in the attempted murder of every Jewish man woman and child in the world. 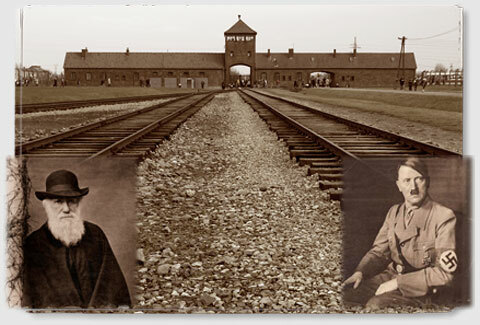 The Holocaust was to be carried out�with an almost total disregard for political and economic consequences. Anti-Semitism can�t explain why the Nazis engaged in this genocide; even at the risk of losing their titanic war against the Soviet Union which they knew would invite their own destruction. The answer is far more frightening: Hitler believed that when the last Jewish family was dead, the entire Germanic race would mutate into a new species; the Aryan Ubermensch. They thought this evolutionary transformation would win the war. There is also a deeper problem: Because the Holocaust is not completely understood, the true perpetrators of the crime were never brought to justice. The scientists behind the Holocaust are now echoed by Richard Dawkins and Daniel Dennett, the leading ultra- Darwinists who proclaim the triumph of Atheism and prohibit any alternative discussion in schools or media. If you want to know why Federal and state law in the United States strictly mandate Darwinist education, even for 10 year-olds, read this book!